Just click on the map to see travel packages, accommodation and information display for each travel region. We are happy to offer you one of our Brazil group travel on your desired date as a private trip as well. Brazil is pure pleasure and features an incredible variety. The most populous and largest country in South America covers almost half of the continent and is home to nearly two hundred million people. 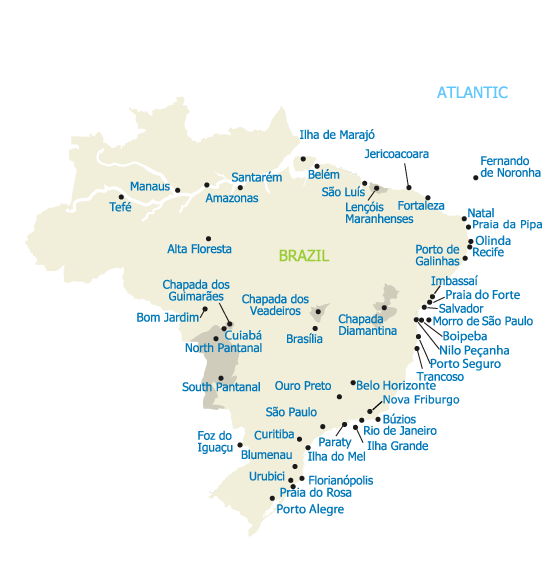 The cultural activities and the number of cities and landscapes to discover on a trip to Brazil are extensive. From ultra-modern cities like Brasilia or Sao Paulo to primordial jungle regions with indigenous populations, the country has it all. In Brazil, you connect with the vastness of the Amazon, fantastic beaches, the Sugar Loaf in Rio de Janeiro, carnival and samba. In addition, Brazil is complex. Nature and culture are very different from the north to the south of the country. This is naturally reflected in the ethnic range as well. The Brazilian population was born by Indian, African and European influences. Brazil is a melting pot of different races and cultures, which are reflected in the traditions, religion, and not least in the tasty cuisine of each region. 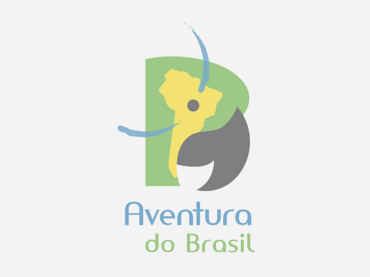 In summary: An individual Brazil trip is worthwhile for everyone! A must for any travelers in Brazil is the visit of the vibrant metropolis of Rio de Janeiro, beautifully located between the sea, hills and the Rainforest. Get to know the culture and history of this fascinating city. Enjoy sunny days on the magnificent kilometer-long sandy beaches and the spectacular views from Corcovado and Sugar Loaf Mountain. Impressive natural spectacles meet travelers in Brazil, in the protected Pantanal or the Amazon, the largest tropical rainforest in the world. Embark on a discovery tour along the endless river and immerse yourself on a guided tour into the diverse flora and fauna. The northeast of Brazil attracts with the baroque and colorful historic center of Salvador and the impressive table mountains of Chapada Diamantina. Further, north, the dreamlike National Park Lencois Maranhenses, that extends between turquoise lagoons and dunes. The wild Iguacu waterfalls, plunging in the rainforest and roaring into the depths, are another natural wonder that you should not miss during your trip to Brazil. Other highlights include the countless vast coastal areas with secluded natural beaches, which find their completion on islands such as Ilha Grande or Fernando de Noronha. There are also many lesser-known areas, where there are hidden treasures and landscapes, and where you can meet the authentic local population. The possibilities are endless in Brazil - see for yourself on a customized tour that meets your requests! The diversity of the country is equally shown on our Individual Trips, where we offer a mix of different excursions, lodging and packages. During your journey, you undertake tours in small groups or privately with guide. Stay in typical lodging, whether in a comfortable hotel, a jungle lodge in the rainforest or a cozy Pousada right on the beach. Considering the size of Brazil you should be aware of some priorities set with travel arrangements and longer distances to travel by plane to have an optimal travel experience. Design your trip individually, according to personal taste with a focus on culture or nature. Decide for yourself how much time you want to spend experiencing Brazil and how many recreational and bathing days you would like in your vacation planning. When planning your trip, we are always at your disposal. Our Brazilian language trip takes you to Florianopolis, the capital of the state of Santa Catarina. Florianopolis is considered one of the cities with the highest quality of life in Brazil. Your language course includes 3 hours of language instruction 5x a week including teaching material and German-speaking support on-site. The language school is located in Lagoa da Conceicao, a small, lively district of Florianopolis. Lagoa da Conceicao combines dunes, mountains and the largest lake on the island and is located about 14km from the city center. Cristalino Jungle Lodge is located in the state of Mato Grosso in Brazil's inland - more precisely Alta Floresta, a city in the Amazon Rainforest. Here you can experience nature and the unique tropical rainforest up close. Cristalino Jungle Lodge offers a luxurious ambiance with close connection to nature. The lodge is ideal for all travelers who want to immerge in the tropical vegetation without sacrificing comfort. Discover Sao Paulo, Brazil’s biggest City. Enjoy the different parks and historical monuments. Explore the historic city center and the Japanese district on this 3-hours private Tour. Relax in Ibirapuera Park and visit two museums. Explore many beautiful restored buildings in the historical center of both Recife and Olinda in the federal state of Pernambuco! Olinda is World Cultural Heritage of UNESCO and offers its visitors houses, baroque churches and monasteries that are hundreds of years old. The reefs on the beach of Boa Viagem, which gave the city its name, as well as impressive contrasts between old and new architecture can be discovered in Recife. You will stay in the charming Pousada dos Quatro Cantos, which is an excellent home base to explore the many cultural and historical highlights of both cities. Enjoy a 3-day exclusive eco-trip with accommodation at the Eco Lodge Itororo. From Rio de Janeiro to the Atlantic Rainforest to the Eco Lodge Itororo in Nova Friburgo. You’ll go on a hike in the Tres Picos State Park and to conclude the trip, a hike through the Atlantic Rainforest. Experience and enjoy culture, nature and history during your wonderful 4 day trip to Paraty. Paraty old town has been under monument protection since 1958 and is largely closed to traffic. Another highlight of Paraty is the surrounding nature, fresh air and water.